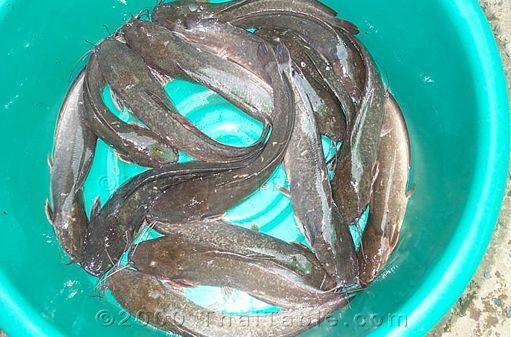 Catfish is called 'pla dook'. In Thailand, they are usually half the size of the ones you see in U.S. markets. They live in shallow water in ponds, streams, rice patties and rivers. For our recipes here, U.S. catfish is comparable. If you visit open air market in Thailand, you might see grilled catfish on a skewer. It is slow cooked and smoked on the grill and eaten with fish sauce, hot pepper and lime juice. That was all that I wanted to eat when I was a little kid.